Need a break? Escape to Wilsons Prom Accommodation and discover what the region of Prom Country has to offer. At Prom Coast Holiday Lodge, we offer modern and comfortable accommodation for couples, families and groups situated within the rolling hills and sandy beaches. We offer affordable Group Accommodation and private cottages that are suitable for all budgets whilst not sacrificing on quality. Conveniently located within a leisurely 2 hour drive south east of Melbourne you can head down for a weekend getaway or a mid-week escape and enjoy the nearby beauty of Wilsons Prom National Park or swim in the safe waters of Waratah Bay and Sandy Point. If you want an unforgettable and relaxing experience, you will not be disappointed by our Accommodation at Wilsons Prom. Spacious and modern, the group lodge is popular amongst families, groups of friends and businesses. 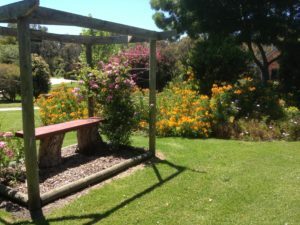 It is ideal for special birthdays or weddings, business workshops, school/university groups or other social and sporting groups such as bushwalkers, cycling or craft groups. The lodge consists of 4 large bedrooms that can comfortably house 20 people. The group accommodation also caters for people with disabilities, including one wheelchair-friendly bathroom and toilet. 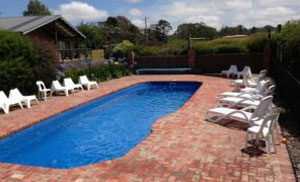 Accommodating diverse groups with various needs and interests, Prom Coast Holiday Lodge is the number one Wilsons Prom accommodation for large groups. Sleeping between 2 and 6 people, our luxury 1 & 2-bedroom cottages offer ample privacy and are perfect for intimate couple or family getaways. Our cottages offer all the pampering and comfort you deserve, some with a wood fireplace and a spa. Fully self-contained and offering all modern amenities, the cottages are equipped with leather lounges,TV’s, DVD players, iPod docs, WiFi, a fully equiped kitchen and split system heating and cooling. Our popular Group Lodge consists of 4 large rooms sleeping up to 20 people. The ideal venue for families, friends, bushwalkers, cyclists, craft groups, schools and small weddings. Our spacious and well appointed cottages are fully self contained with leather sofas, woodfire, spa and beautiful garden views. The accommodation is located on a picturesque 10 acres, with luscious greenery and well-maintained gardens and surrounds. The expansive grounds are perfect for children to safely run around, kick a football, play cricket or ride their bikes for hours on end. More suited towards the summer months, our 13m pool is the perfect place to relax and cool off after a long day of exploring, or simply spend all day lounging around with a book. Our farm animals are perhaps one of our biggest attractions. With cows, sheep, goats, chickens and a peacock, children are welcome to interact with the animals at any time even being permitted to feed the animals (in season) and collect the eggs. With 3 acres of untouched bush at the rear of the property, wombats, wallabies, koalas and birdlife are also regular visitors. 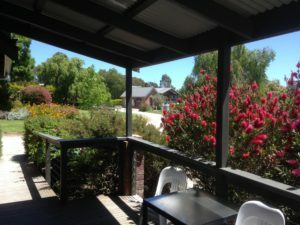 My daughter and I took a road trip from Melbourne - about 3-4hours and stayed at the fabulous cabin at Prom Coast. We were warmly greeted and the cabin exceeded our expectations with lovely fittings and everything we needed for a couple of nights stay - could have stayed a week! It is very close to the National park - about an hours drive. Such a quiet environment in a lovely setting. Fabulous stay in a new, modern cabin overlooking the farm animals in the paddock and seascape beyond the tree line. We could not find anything close to this quality stay (and self-contained) for the price. Would absolutely recommend anyone visiting the Wilson's Prom to stay at this beautiful peaceful location!! Loved it. We returned to this idyllic setting again this summer. It’s one of those places we keep visiting, due to the proximity to Wilson’s Prom, Sandy Point and similar beautiful locations. Norm always welcomes people with such warmth, and is keen to share his extensive knowledge of the area. The grounds are well kept and the facilities for children super. Love it! The cottages here are so lovely. Very well equipped with a kitchen that has everything you need to self-cater. We were in cottage 1 which is bright, clean and warm. 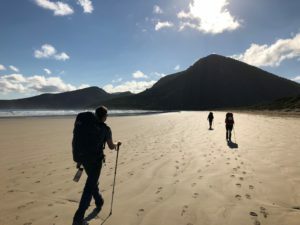 It is one of the closest accommodations to Wilson’s Prom and it was great to come back to our cottage at the end of a hard day hiking. 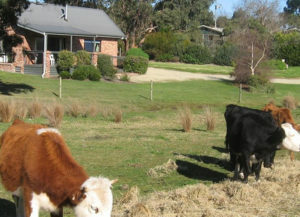 The setting was so peaceful with goats, cows and native birds outside our windows. I would highly recommend staying here. We loved it! Just returned from here, was a perfect spot for a quiet getaway with two children. Norm the host was very friendly and helpful with local knowledge but also left us to our own devices as well. 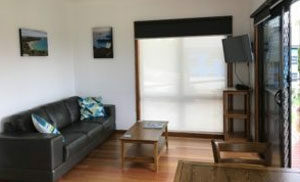 Great accomodation and close to great places to visit including Sandy Point and Wilsons Prom. Highly recommended.